Gather your materials. No, I wasn’t joking, it really does just require corn, wire, and a stick. I guess if you want to be technical you will need wire cutters (in this case old garden shears) and something to hang the swag with (more wire). Take one ear of corn and overlap the pulled back husks of the second ear. 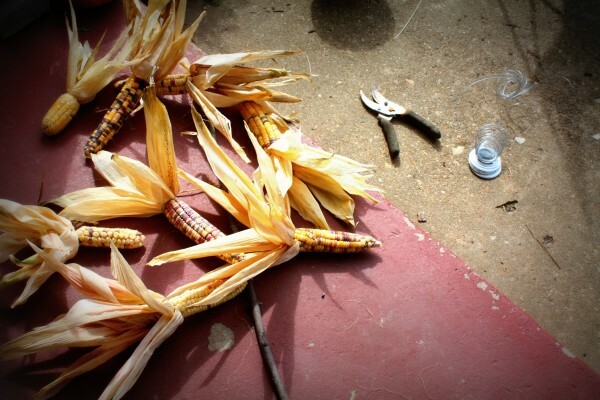 Wrap wire around the corn at the base and through half the husks of the first ear. I suggest using half the husks so you can fluff the other husks out to fill in between the ears. Obviously, I didn’t worry to much about the wire showing. I knew this would be hung high over my door and not really visible from a distance. You could easily hide the wire by using brown floral wire or tie with monofilament instead of wire. I wired 4 ears together facing one way and 4 ears the other direction. Then I wired them to a branch (i.e. the stick) I had laying about the yard. I suggest wiring the corn together first before attaching to the branch. This allows for the corn to hang down freely and look less rigid than when wired directly to the branch. 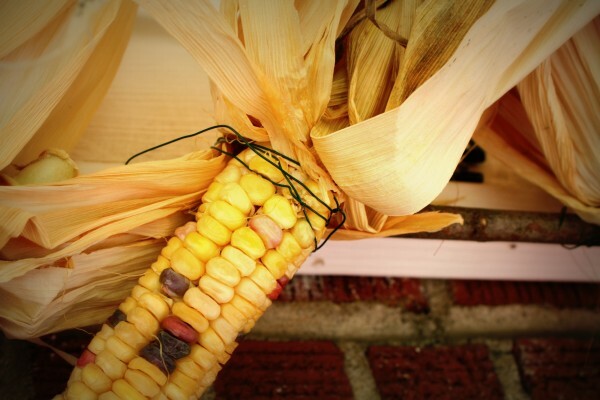 The corn isn’t all that heavy so you could simply hand the corn attached together however I found a firm base makes it much easier to hang the whole swag on the wall Plus it allows you to arrange the corn attractively while it is on the ground. As you can see from the above picture using a rustic branch, as opposed to a dowel, blends with the harvest theme and doesn’t stand out if it shows between the ears. There really is no step four because it is that easy. Usually the grocery stores offer indian corn this time of year but you might also try your local farmers market. 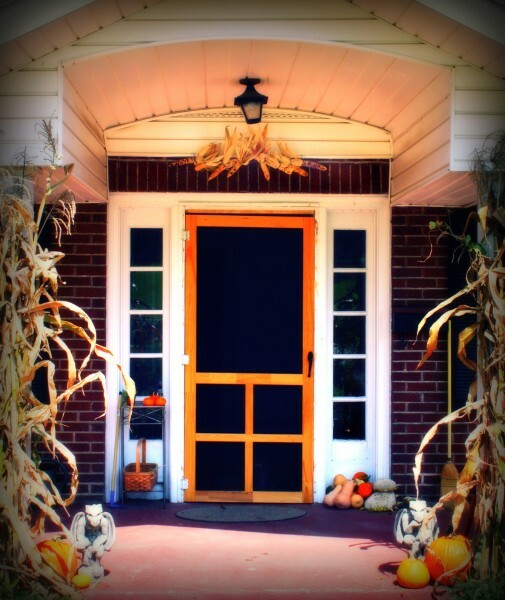 While your out, snag a few pumpkins to give an extra harvest touch. 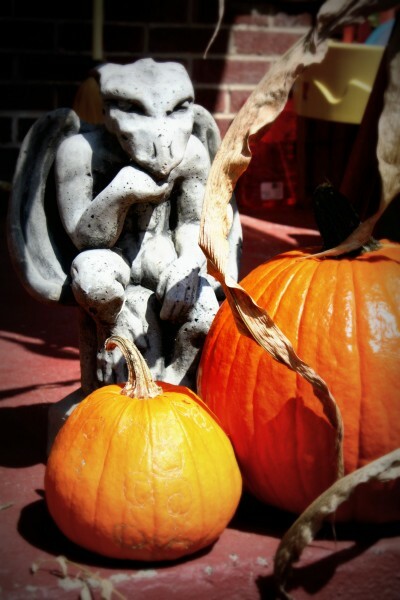 Since Halloween is right around the corner I couldn’t help but add a gargoyle into the mix. The gargoyles are a nice touch.